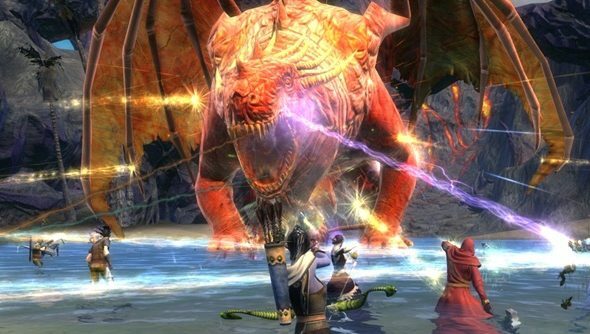 Those lovable chaps over at Rift Junkies have had a chat with Rift’s design developer Hal Hanlin about the MMO’s upcoming expansion Conquest. As you may already know, it contains epic battles between three factions at once, something which excites us as much as it makes us glad we’re not game designers. Bringing such a radically different method of player interaction into a game that’s more frequently updated than our caffeine levels can’t be easy. But one of the things that’s made Rift stand out among the swathes of current MMOs is its near-constant updates, something Hanlin acknowledges. “We are dedicated to RIFT, not to a given feature of it, and we are hyper-responsive to the needs of our players”, Hanlin said. “None of that is hype; it’s provable fact.” It’s an approach to creating games and updates that seems to be straight out of the Valve textbook – throw it out there, see if people like it, and if they do make more of it. Which is where the three-way portion of patch 1.9 – dubbed Conquest – will hopefully succeed. The patch also increases the PvP rank cap to 50, and adds new armour and weapon sets to the game. But as Hanlin explained, the triangular combat completely changes the way the game is played. Rift’s 1.9 patch is currently in development and a release date hasn’t been specified. However, if previous patches are anything to go by, we reckon it’ll be with us in late June or early July.